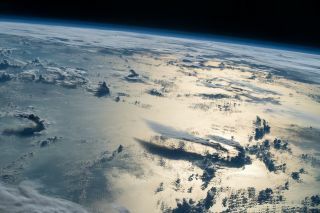 Sheared thunderstorms over the Philippine Sea take center stage in this amazing view of Earth from space taken by an astronaut on the International Space Station on June 25, 2016. The image was one of NASA's 16 top Earth photos by astronauts in 2016. NASA has released some of the most artful, majestic and sometimes just plain cool images taken by astronauts on the International Space Station in 2016. Released as a video slideshow, the 16 pictures were all taken from the space station's windows by astronauts, and not by satellites in orbit. The images spectacular views of cities from space (like Dubai), amazing natural features (Lake Urmia in Iran) and some stunning artificial features, such as Lake Nasser in Egypt (the lake is the reservoir behind the Aswan Dam). You can take a longer look at the Earth photos in our photo gallery here. The International Space Station orbits 255 miles (410 kilometers) above the Earth, offering a perfect vantage point — in which the curve of the planet is visible — for astronauts in orbit. Looking at weather systems or landscapes from that perspective, one can see large scale structures invisible from the ground, such as dune patterns in deserts or the perfect crater structure of Japan's Mt. Fuji. You can find difference sizes of the individual images directly from NASA's Flickr photo album here. You can follow SPACE.com on Twitter @Spacedotcom. We're also on Facebook & Google+. Original story on Space.com.